Rotary’s founder, Paul Harris, believed that serving humanity is “the most worthwhile thing a person can do,” RI President-elect John F. Germ said, and that being a part of Rotary is a “great opportunity” to make that happen. Germ unveiled the 2016-17 presidential theme, Rotary Serving Humanity, to incoming district governors on 18 January at the International Assembly in San Diego, California, USA. “I believe everyone recognizes the opportunity to serve Rotary for what it truly is: not a small opportunity, but a great one; an opportunity of a lifetime to change the world for the better, forever through Rotary’s service to humanity,” said Germ. Rotary members around the globe are serving humanity by providing clean water to underdeveloped communities, promoting peace in conflict areas, and strengthening communities through basic education and literacy. But none more important than our work to eradicate polio worldwide, he said. Last year’s milestones leave just two countries, Afghanistan and Pakistan, where the virus still circulates. Polio would be only the second human disease ever to be eradicated. Germ, a member of the Rotary Club of Chattanooga, Tennessee, USA, encouraged attendees to return to their clubs and communities and spread the word about Rotary’s role in the fight for a polio-free world. “People who want to do good will see that Rotary is a place where they can change the world. Every Rotary club needs to be ready to give them that opportunity,” Germ said. Susan Davis shares a photo with school children in Pakistan. Davis co-founded BRAC USA to advance the mission of BRAC — Bangladesh Rehabilitation Assistance Committee — which is dedicated to fighting poverty. For her work to mitigate extreme poverty around the world, Susan Davis has received many honours. But the 2015-16 Rotary Foundation Global Alumni Service to Humanity Award has special significance. A decade ago, Davis co-founded BRAC USA to advance the mission of BRAC — Bangladesh Rehabilitation Assistance Committee — the world’s largest nongovernmental development organization, which was founded after Bangladesh’s partition from Pakistan in the 1970s. The U.S. branch is dedicated to fighting poverty and to creating opportunities for the poor in Africa and elsewhere. Fulfilling that mission hasn’t been easy. Davis’ work has been disrupted by floods, cyclones, earthquakes, and war. Even worse was the sudden and deadly Ebola epidemic in 2014 in West Africa. “I wasn’t sure how to protect our staff and clients and accompany these vulnerable communities out of this tragic situation,” says Davis, who served as BRAC USA’s president and chief executive officer until her departure this month. She quickly contacted Ebola experts and connected them with BRAC USA’s representatives in affected countries. “I lost sleep and cried with each death,” she says. Two of those deaths were particularly painful. Ophilia Dede, a BRAC credit officer in Liberia, and her husband succumbed to the virus, leaving behind a little girl. Davis helped set up a scholarship fund for her education. But she doesn’t allow such painful experiences to deter her. From 1987 to 1991, Davis championed microfinance while working as a program officer with the Ford Foundation in Bangladesh. She developed a consortium that raised $175 million, increasing the availability of microloans in Bangladeshi villages to 44 percent from 5 percent, she says. Though debates endure over how much credit microfinance should receive for the country’s progress, conditions in Bangladesh have improved significantly: According to The Economist, life expectancy in the country rose from 59 to 69 during a 20-year span ending in 2010. Davis also is co-author, with journalist David Bornstein, of the book “Social Entrepreneurship: What Everyone Needs to Know.” And she is involved with Ashoka, a nonprofit organization that supports social entrepreneurship; as a director, she oversaw its expansion to the Middle East, North Africa, and Central Asia. A resident of New York City, Davis is widely recognized for her work in the field of international development. She was appointed to the board of the United Nations Fund for International Partnership in 2012, is a member of the Council on Foreign Relations, and has served on the boards of the Grameen Foundation, the Sirleaf Market Women’s Fund, and the African Women’s Development Fund USA. Davis has come a long way from the small town in southwest Louisiana, USA, where she grew up. The Rotary scholarship provided her first opportunity to live abroad. She believes that her Oxford experience allowed her to be taken seriously, and credits it with helping her land a job with the Ford Foundation. Perhaps most importantly, says Davis, that Rotary-sponsored year gave her an entirely new perspective on power and privilege. Davis will be honored at the Rotary International Convention in Korea in June. At this time of year, it can be hard to come up with truly life-changing gift ideas. But what if you could give a gift that would change someone’s future? What if you could give someone whose hands were damaged by burns the ability to use them again? Or a medical trainee the chance to learn new skills that would benefit their community? This festive season, you can do that by giving your friends and family an Interplast donation gift card. 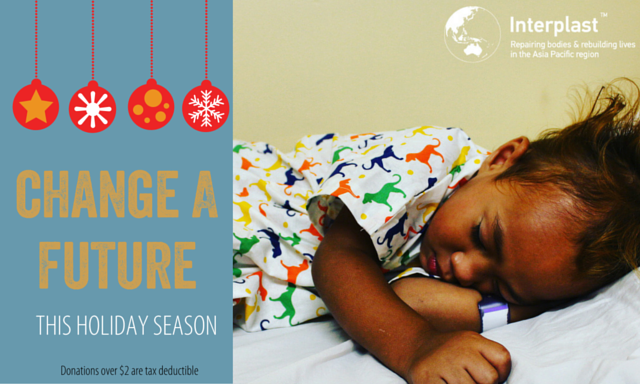 Your gift will give someone the chance to receive life-changing surgery, and help us provide medical education and mentoring in 17 countries across the Asia Pacific region. Our surgical teams restore function – and hope – to people affected by burns, tumours, hand and foot injuries, congenital anomalies and more. In Australia and New Zealand, we sometimes take it for granted that if we needed to, we could have these conditions treated by well-trained medical professionals, in a timely manner. But in many of our neighbouring countries they often can’t be treated effectively or at all, impacting on people’s ability to live a fully-functional life free from stigma and social exclusion. Lack of training and equipment means health systems in the countries where Interplast works are not always able to help enough. You can make a huge difference. Interplast’s volunteer surgeons, anaesthetists, nurses and allied health professionals have changed the futures of hundreds of people and their communities this year. There is so much more to do, and you can be a part of it. This holiday season, give friends and family a gift like no other – the knowledge that someone’s future is so much better thanks to them. On December 1, 2015, Stop Hunger Now is participating in #GivingTuesday, a day dedicated to giving back during the busy holiday season. Click here to join the fight against hunger. We are making progress in that fight, but we need you. Nearly 800 million our global neighbors are chronically malnourished. That number is big — too big — but each of those people has a name, a story, and a life. Just like you. Like Anna in Armenia. Before her school started providing Stop Hunger Now meals, Anna was the only member of her family who attended school. Now, her sister and cousins attend, and they are all happier and healthier. In fact, Anna has gone from having the worst test performance in her class to having higher test scores. She hopes to have the highest grades in her class one day. Stop Hunger Now sends meals to children around the world like Anna, children who have dreams and plans for their futures. Give to Stop Hunger Now on #GivingTuesday, Dec. 1, by clicking here. There, you can sign up to become a monthly donor and celebrate #GivingTuesday every month. And, through the generosity of SanDisk Corporation, gifts to Stop Hunger Now made by Dec. 31, 2015, will also be matched dollar-for-dollar up to $100,000. Double your impact and give to Stop Hunger Now on December 1st by clicking here. Together, we can create a world without hunger. There were no Agenda items placed on notice this week. The motion was unanimously carried by all present. Next “Go To Meeting” is scheduled for Thursday, 12th November 2015 at 7:00 pm. Watch our 3rd Annual World Polio Day Global Update webcast. How close are we to a polio-free world? What’s needed to finish the job? Can we make history together? Watch our third annual World Polio Day webcast for a global status update on the fight to end polio and take part in the conversation. Time magazine Senior Editor Jeffrey Kluger is our moderator, and UNICEF Executive Director Anthony Lake is a keynote speaker. The webcast features appearances by Emmy Award-winner Archie Panjabi, Grammy Award-winner Angelique Kidjo, actress Kristen Bell, WWE Superstar John Cena, The Doctors co-host Dr. Jennifer Berman, CDC Polio Eradication Branch Chief John Vertefeuille, and other special guests. Help us make history today. Share your voice online, advocate with your government, or create your own World Polio Day event. Download the resources below to get started. No child anywhere should suffer from this completely preventable disease. As little as 60 cents worth of vaccine can protect against polio. We need your voice to end polio now. Download the resources below to join us and make an impact on World Polio Day. Learn about polio eradication, how to get involved, and how to make your voice heard on World Polio Day. Share these graphics on your social networks to raise awareness and support for the final push to end polio. Rotary and its partners cannot end polio alone. We need your help to secure support from governments, nongovernmental organizations, corporations, and others. Please advise Dorothy Barwick if you will be there on the night and advise us of any guests/partners who will be attending so that we have some idea of the number of people attending. If you could let us know by Monday the 19th of October it would be much appreciated. It was decided at the Joint Presidents Meeting that individuals wishing to find billets for the Tamworth Muster next weekend should make their own arrangements with potential billets. No firm date has been set down for the “Stop Hunger Now” program and it is still loosely scheduled for the last week in November or the first week in December. It was noted that significant work had been done on the club web site – thank you Ken. John & Dorothy are still not receiving “The Rotarian”. A letter has been sent to RI data corrections but at this time I have only received an automated acknowledgement that my email has been received. District 9650 World Polio Day Fundraiser Wednesday 21st October 2015 Movie premiere of Bridge of Spies, an historical, biographical drama thriller directed by Steven Spielberg and starring Tom Hanks, Mark Rylance, Any Ryan and Alan Alda. Brooklyn lawyer James B Donovan (Tom Hanks) is thrust into the centre of the Cold War when he is given the mission to negotiate the release of Francis Gary Powers, a pilot whose U-2 spy plane was shot down over the Soviet Union in 1960. Francis Gary Powers Jr, the pilot’s son, has a cameo role in the film and was also brought on as a technical consultant. He is founder of the Cold War Museum. Tickets are available from Phil Lyon (0407 844 561). Please note that the Enews has another date listed – the date varies from one town to the next – in Tamworth it is showing on Wednesday 21st October. The District Muster is on the 18th & 19th of October and the venue is the Joblink Plus premises. The trip to Lightening Ridge is on the (Friday) 23rd of October to Sunday 24th of October. The trip to Lightening Ridge has been “modified”. The last information I heard was that there are only around 13 acceptances, the bus has been cancelled, as this was a significant component of the costs, and a number of us are travelling in our own vehicles and some are taking their own Caravans (including Annette and I).Some cabins may be available for anyone who does not own a caravan but you will need to book soon. As I understand it there are still places available, so anyone interested should contact Evrol Keeys on 0414 782 707 for the latest details. Next “Go To Meeting” is scheduled for Thursday, 22nd October 2015 at 7:00 pm. Please note: The next meeting is a face to face meeting at the City Sider Motel and this link is only included for people who cannot attend or people from other clubs who wish to visit our club or do a makeup.